It's a political movement that started with Madonna. In 1990, a bikini-clad Material Girl wrapped in an American flag urged MTV viewers to vote by rapping about Thomas Jefferson and Abraham Lincoln, switching up the lyrics of her then-hit song "Vogue." It was the first PSA for Rock the Vote, an organization whose mission is to register young people to vote and urge them to participate in the political process. And Rock the Vote has had its work cut out for it; quelling apathy among young voters is no easy feat. Voting rates among 18- to 24-year-olds for all elections dropped from 50.9 percent in 1964 to 38 percent in 2012, according to the U.S. Census Bureau, which also reports that in every presidential election since 1964, 18- to 24-year-olds have voted at lower rates than all other age groups. LL Cool J starred in Rock the Vote PSAs in the early '90s. "It's always been the case, ever since surveys started in the 1950s, that young people were the least likely voters of all age groups. I think it really became noticeable when 18-year-olds got the vote in the 1972 election, when the constitution was amended to lower the voting age during the Vietnam War," said Barry Burden, a political science professor at the University of Wisconsin-Madison. "During the Clinton era in the '90s, the parties started to think about young people as a demographic that hadn't been fully tapped. The '08 election [of President Obama] was the high-water mark for voter participation, but even then, the turnout among young people was still sad." Rock the Vote is trying to reverse that trend. It's been a pioneer in encouraging young people to vote with the backing of the entertainment industry and in launching efforts to make it easier to do so. Before the internet, it pushed state governments to let voters register by mail and launched the first toll-free number to let voters register by phone. In 1999, Rock the Vote created the first online voter registration tool, and since 2008, it has registered more than 6 million voters online, including 410,000 voters so far in 2016. "Rock the Vote can take credit for registering millions of young people to vote over the years, and they've been persistent and creative in doing it," Burden said. Throughout its history, Rock the Vote has been so entrenched with MTV that many people think they're one and the same. Rock the Vote is, in fact, a stand-alone nonprofit that works with MTV and thousands of other organizations on get-out-the-vote efforts. But the ongoing partnership with MTV makes sense, particularly because Rock the Vote started as an effort to combat government censorship in the music industry. Madonna pioneered the Rock the Vote movement. Rock the Vote's founder, Jeff Ayeroff—a music industry executive who oversaw marketing efforts and videos for artists including Madonna, Don Henley, Talking Heads, ZZ Top, Prince, Eric Clapton and Echo & the Bunnymen as a senior vp at Warner Bros. in the '80s—started the organization in 1990 in response to government censorship campaigns against artists' use of explicit language and parental advisory labels on CDs as experienced by groups like N.W.A. and 2 Live Crew. Ayeroff realized that if more young people were registered to vote and were thus able to vote on issues like censorship, it might help combat it. "Our founders knew that young people were being affected by censorship and realized the power that they had as voters," said Luis Calderin, vp of marketing and creative at Rock the Vote. "Then it became larger than that, and we decided to empower young people to use their voices to fight for other things that were important to them." For MTV, the partnership has always been a natural fit, said Ronnie Cho, MTV's head of public affairs. "MTV has a history of getting involved with social justice issues and social consciousness, and voting is a big piece of that," Cho said. "Back then, there wasn't an emphasis on young people and their power and ability to shape the democratic process. It was a novel message that they were sending out, and it filled a void that didn't exist." Rock the Vote PSAs that aired on MTV in the '90s and early 2000s starred the likes of LL Cool J, Aerosmith, Lenny Kravitz and Anthony Kiedis of the Red Hot Chili Peppers. The ads stressed the importance of voting and freedom of expression. In 1993, Rock the Vote helped pass the National Voter Registration Act, or Motor Voter Bill, which allowed people to register to vote when applying for or renewing their driver's licenses. It did so with the help of an MTV PSA starring R.E.M. front man Michael Stipe, who quaintly urged viewers to call the president and ask him to pass the bill. The band also attached ready-to-mail postcards addressed to senators to its album, Out of Time, asking them to support the bill, according to Rolling Stone. 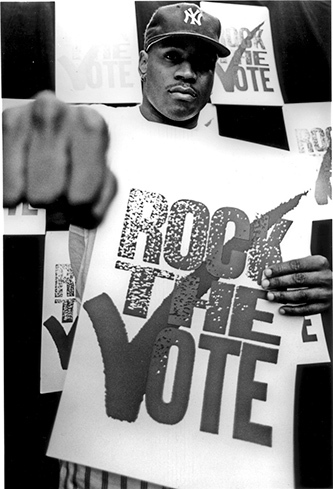 In 1999, Rock the Vote created its online voter registration tool, and throughout the 2000s, it produced more celebrity-filled PSAs and events. Snoop Dogg launched a Rock the Vote bus tour in 2004, and in 2008, Christina Aguilera starred in a PSA that hearkened back to Madonna's: She sang "America the Beautiful" with a flag draped not around herself, but around her newborn son. PSAs for the 2012 election, #WeWill, starred Miley Cyrus, Neil Patrick Harris and Joel McHale. For the midterm elections in 2014, Lil Jon, Lena Dunham and a host of other celebrities starred in "Turn Out for What," a rap video with a clever nod to Jon's hit "Turn Down for What." Rock the Vote's 2016 campaign, "Truth to Power," aims to register an additional 2 million voters before November and drive turnout among voters under 30 in the battleground states of Arizona, Colorado, Florida, Illinois, Iowa, Michigan, Nevada, New Hampshire, Ohio, Pennsylvania, Wisconsin and Virginia. The campaign includes online-only PSAs and videos with actors and musical artists, a national bus tour, and new partnerships with Voto Latino, civic engagement group PushBlack and APIAVote, which works to mobilize Asian Americans in civic participation. Rock the Vote also sponsored panel discussions and events at the Republican and Democratic national conventions and will register voters at Warped Tour and Lollapalooza. Tried-and-true celebrity ads and PSAs are a part of Rock the Vote's 2016 efforts as well. 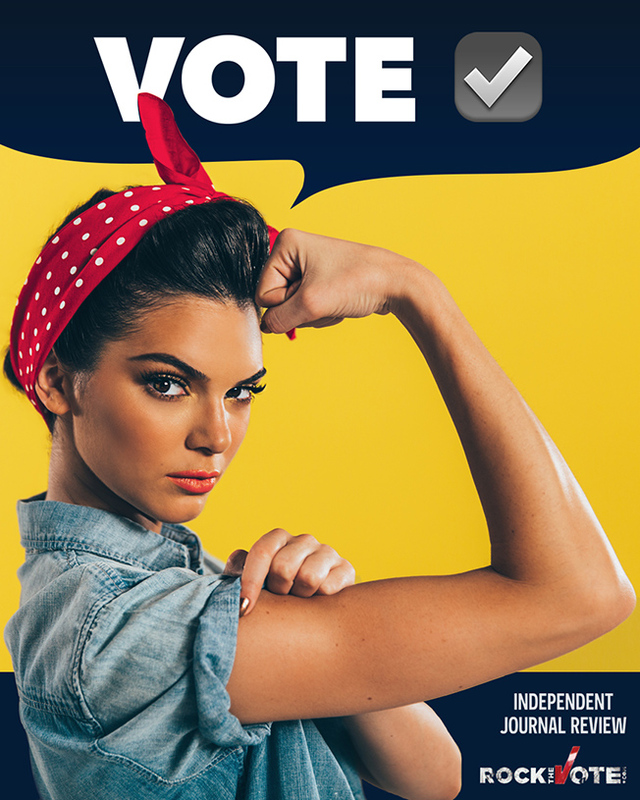 Kendall Jenner appeared in online ads for the Independent Journal Review dressed as Rosie the Riveter earlier this year as well as a video for IJR.com on millennials voting through the ages. Rock the Vote is planning a video series with Funny or Die in which the site's comedians will participate in the "Truth to Power" campaign. A recent collaboration with iHeartRadio featured Blake Shelton, Puff Daddy and Nick Jonas talking about the importance of voting, no matter what side you're on. In March, Rock the Vote partnered with dating app Tinder on "Swipe the Vote," which let users swipe right or left (to agree or disagree) on issues and get "matched" with their ideal candidate. The effort included a Swipe the Vote party sponsored by the Independent Journal Review at the White House Correspondents Dinner. The top three matches were Bernie Sanders (37.8 percent), Hillary Clinton (37.6 percent) and Ted Cruz (14.3 percent). Republican presidential nominee Donald Trump matched with only 8.1 percent of Tinder users. In keeping with its tradition of making it more convenient to register to vote, Rock the Vote teamed with Virgin America this year on a program to register voters on in-flight TV screens. "Our goal is to register as many young people to vote as we possibly can. Every day, 20,000 kids turn 18, and we're trying to engage them wherever they are," Calderin said. "We work with everyone from large brands to smaller advocacy groups." One of those advocacy groups is the All In Campus Democracy Challenge, a voting effort on college campuses sponsored by the nonprofit Civic Nation. The campaign directs students to vote by using Rock the Vote's registration tool. "Rock the Vote has mastered communicating with students, with millennials," said Zaneeta Daver, director of the All In Campus Democracy Challenge. "They have a really strong message, and they've been a great partner for us in working together to make change happen." Rock the Vote's longstanding partner, MTV, also is playing a role in 2016. MTV's current voting campaign, "Elect This," links to Rock the Vote's registration tool and features Throwback Thursday posts of vintage '90s Rock the Vote PSAs on the network and on Twitter. "It's a fun nostalgia play, and our audience loves it," Cho said. "It's an interesting opportunity to represent these two brands that have been doing this for almost 30 years." "Elect This" also focuses on social issues. One PSA, called "What Will You Elect?" highlights issues like climate change, gun safety and LGBT equality. "This year is unlike any year before," Cho said. "Conventional wisdom has been totally thrown out the window. For our audience, there's not one party that represents all views, so our idea was focusing on what people do agree on—LGBT equality, background checks for gun owners. There's broad agreement that we can and should do something about these issues. We're playing a role in making sure our audience gets involved." Research shows that Rock the Vote's efforts work. In 2006, UCLA political science professor Lynn Vavreck and political science professor Donald Green, then at Yale University and now at Columbia, conducted an experiment with Rock the Vote ads, buying air time for those ads on cable systems throughout the country. The study, which was funded by Pew Charitable Trusts, a Carnegie Corporation Strengthening Democracy grant and Yale University's Institution for Social and Policy Studies, found that turnout among young people was a few points higher in places where the ads ran, according to voter files. Kendall Jenner stars in 2016 Rock the Vote PSAs. "It's solid evidence of Rock the Vote's effectiveness," Vavreck said. "Rock the Vote is encouraging good political habits among young voters and getting them to think about voting as something they should regularly do. It amplifies the voice of younger age groups. It's like an alarm clock letting people know the election is coming, which is important. If you can run ads right around the election, like they do, you can boost turnout." And Rock the Vote will continue to help young voters be heard, according to Calderin, who knows a thing or two about them, having previously served as director of the youth vote for the Sanders campaign, which fired up legions of young supporters throughout the country. "This cycle has demonstrated that young people are tuned into politics now," he said. "What has been proven is that they can get involved and move the needle in a major way. Rock the Vote has never been afraid to go there in the tone of what's happening in culture at the time. People are over traditional political verbiage and are looking for straight-up, real conversations, and we're there to help them have those. It's a natural progression of our youth voice. It started out protesting censorship, and now, we're fighting a broken political system and speaking truth to power."